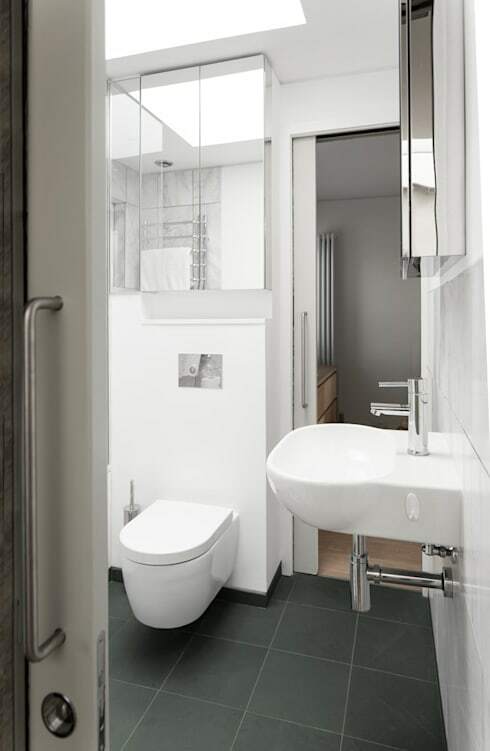 Tiny bathrooms can be a bit of a challenge when it comes to design. More often than not, we tend to feel like we're playing a real-life Tetris game with our furnishings. But these small spaces can introduce some really clever designs to your home, as tiny rooms tend to call for functional and storage-friendly decor. If you've been on the lookout for decoration inspiration, then look no further. We have an unrivaled list of 10 tiny, but perfect bathrooms for you to observe and copy. Each design element in these bathrooms has a specific purpose or function that blend together to create a stylish, space-saving sanctuary. But before you dive in, be sure to check out our professionals page for a free quote. With our team, you know your money will be well spent and that you'll walk away with a room that outshines the competition! 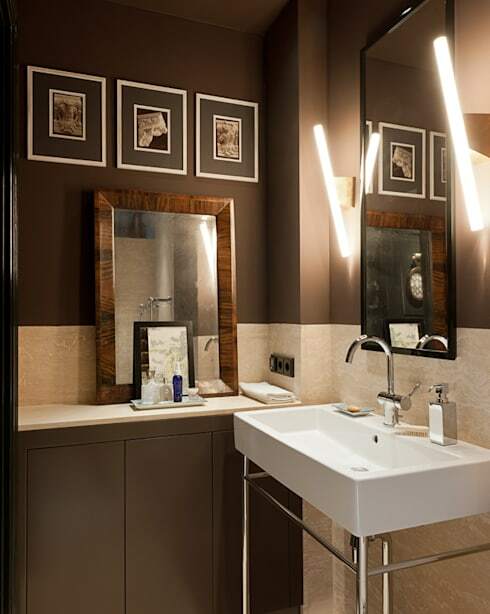 This bathroom looks sophisticated, but not at all stuffy, thanks to the earth tones and neutrals used to decorate. Matte materials, a stone sink, and textured tiles blend together in perfect harmony, adding to the richness of the space. If you're open-minded and not afraid to experiment, you won't go wrong with industrial. Use rough materials, subway tiles, or concrete to create that special flair, and amplify it by leaving pipes and brick or wood exposed. You can even add modern sanitary items with vintage furniture to create a customized look. 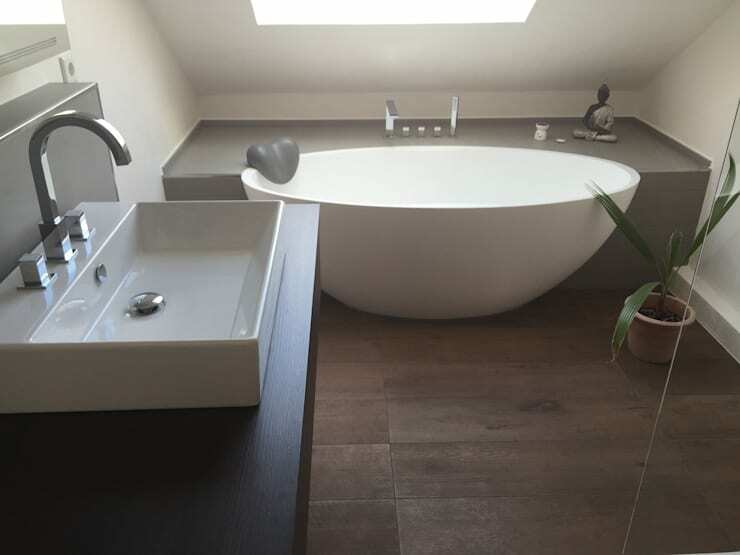 Here we have a loft bathroom, and boy does it look cosy! The huge skylight brings in loads of natural light that enlarge the area and contribute to a calming atmosphere. Just imagine basking in the afternoon glow while soaking in a bubble bath–if that's not the perfect way to relax, we don't know what is! If you like the loft design, then you should check out the style and sophistication of this attic! Tiny bathrooms benefit greatly from more than one tone. Having two or more tones adds dimension and variety, and when you pair a lighter colour with a darker one like we see here, you add to the visual size of it. These sparkling blue, almost mermaid-like tiles are an inspiration for all! 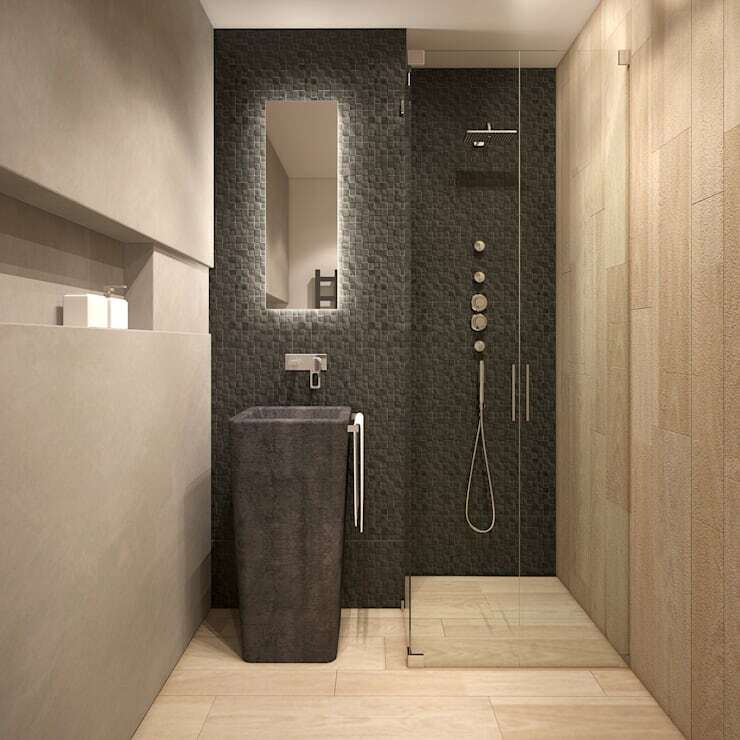 Their glitzy nature makes this bathroom sparkle and exude a cleanliness unmatched by other designs. And having transparent glass shower doors gives the bathroom greater depth. This tiny, windowless bathroom brings together all of the best elements of Scandinavian design in the smallest room of the home. Lightly coloured wooden walls and pristine white tiles create an immaculate space, and the plentiful drawers ensure nothing clutters up the area. Sure, small bathrooms look great with an all white colour scheme, but don't disregard other colours entirely. 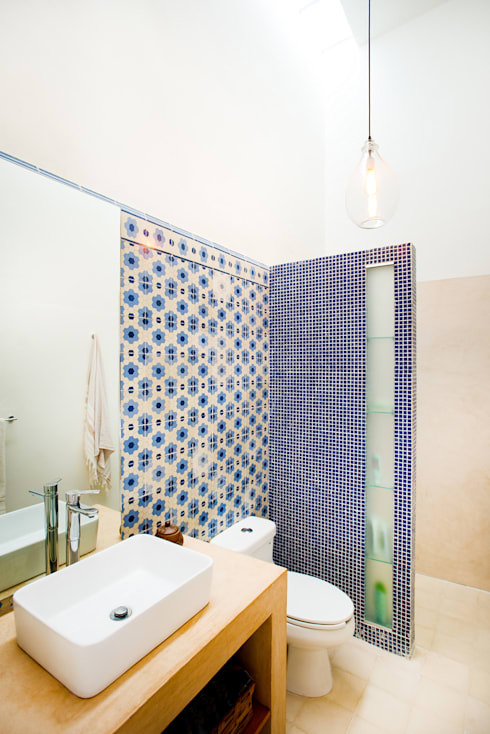 Just take this bathroom as the perfect example–emerald green tiles make this bathroom pop, and the Mediterranean features up top add character and class. 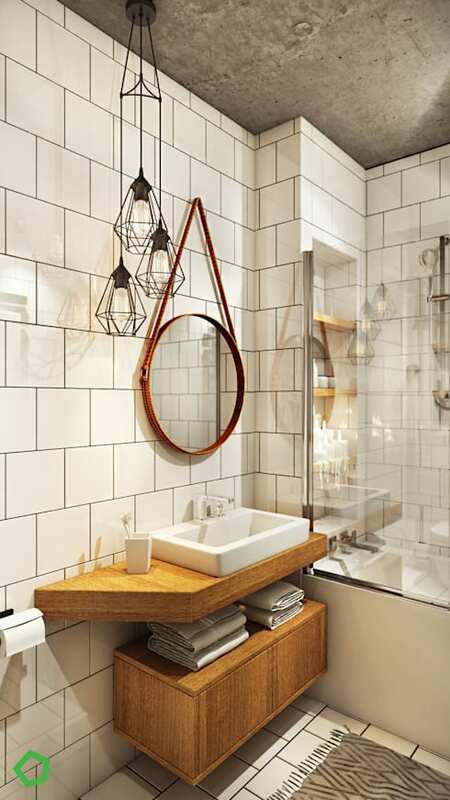 This tiny bathroom has an interesting feature–it also acts as a passageway between rooms. The sliding doors help to save space, and that all-white colour scheme brightens it up like nobody's business. What's not to love about this bathroom? Here we have a great example of what you can achieve with blue. The deep, almost cerulean colour of the tiles calm and sooth us, and when we're trying to get ready in the morning, nothing is better than a calming atmosphere. Our final tiny bathroom is really something precious. We don't often see the colour yellow used in many homes, partly because many people are afraid of its decorating power, but it's actually quite easy to implement, especially as an accent colour. 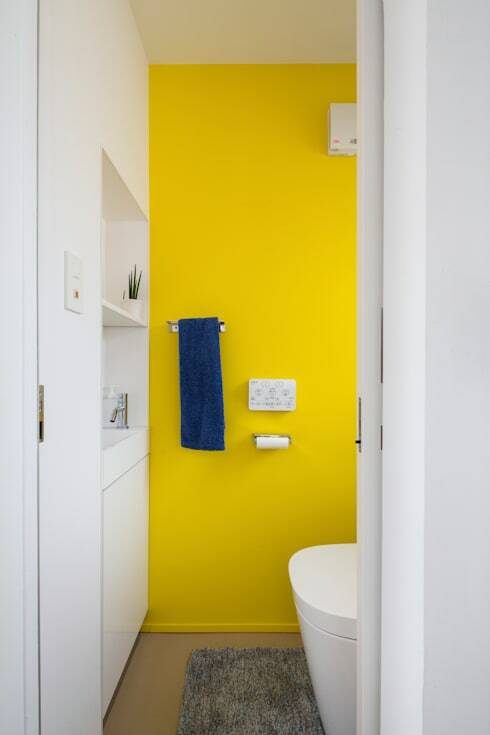 This bathroom employs a predominantly white colour scheme, but the yellow accent wall adds life and a sense of happiness that you can't get with any other colour. We hope these tiny bathrooms were able to ignite your imagination and help you come up with the perfect design for your tiny bathroom! And if you have more than one tiny area of the home, like the bedroom for example, then we know you'll appreciate these five ways to get rid of clutter! Which bathroom was your favourite? We'd love to hear from you in the comments section below!